Capsule Summary: A change in military scrip leads Charles to implement a get-rich-quick scheme that backfires. Meanwhile, Klinger’s attempt to get into West Point also backfires. I much prefer the B story in this episode, involving Klinger’s latest Section 8 stunt, to the A story in which Charles goes to great lengths to rip of South Korean civilians and, not surprisingly, gets his comeuppance. 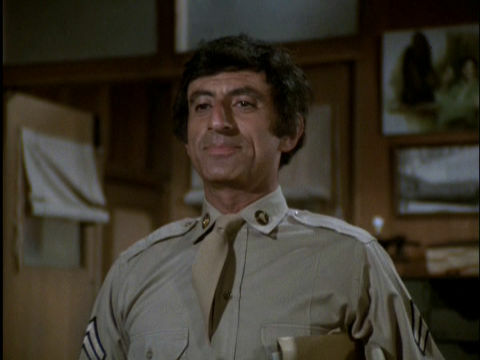 I love how gleeful Colonel Potter is when Klinger walks in wearing his uniform. After so many similar and obviously fake stunts, I suppose Potter can be forgiven for being intrigued by something new. I’m conflicted about the ending to Klinger’s B story, however. I wonder if it would have been better had he actually done okay on the West Point exam but still failed. That would have given Potter and B.J. a bit of a shock, not to mention Margaret and Charles. Klinger could take some comfort in the fact that he didn’t blow the test and the status quo still could have been maintained. The way it actually played out leaves Klinger distraught and feeling pretty stupid. He couldn’t even spell his own name right, let alone a single question on the test. I wonder how well Margaret would have done. If she had decided to take the test alongside Klinger to prove that she deserves to be in West Point and also failed, that could have led to some amusement. As for the A story, Charles obviously is not painted in a very kind light. His treatment of the South Koreans is unfortunate at best, downright cruel and a little racist at worst (particularly his comments about bowing). This was the 13th episode produced for Season 6 so the writers either thought they had a handle on how they wanted Charles to act or they weren’t so sure and basically made him a Frank stand-in. In future episodes, Charles is shown to be somewhat money-hungry. Still, the fact that Hawkeye and B.J. refer to him as a fink suggests there was more than a little Frank in this episode. Klinger is out of uniform. We never learn if Mr. Kim got his payment for the suit he made for Charles. Nor do we find out of he gave Hawkeye and B.J. the free dress shirts he promised them if they dealt with Charles. Watch closely when the PA announcement is made that the scrip change is starting. There’s a stampede and at least one person falls down. I doubt that was scripted. This was the second of two episodes in which Peter Riegert is credited as playing Igor rather than Jeff Maxwell. The first was “War of Nerves” earlier in Season 6. Here he gets into a fight with Zale over money. Richard Lee-Sung makes an uncredited appearance in this episode. He’s in the crowd of South Koreans dealing with Charles. I wonder how much money Charles lost. Hawkeye took $400 in soon-to-be-worthless blue scrip but the bag was still relatively full of $100 bundles. Charles only paid 10 cents on the dollar so he probably didn’t lose more than $50-60. Still a lot of money in the 1950s. Jeff Maxwell comments on Ken Levine’s blog on occasion, and I reached out to him asking about this other guy credited as Igor this season, but he didn’t respond. Still, Jeff is such a terrific guy, very nice and gracious with the fans for someone who plays such a small role on a long-running series. Maybe he is a terrific guy, but unfortunately his post-M*A*S*H life wasn’t as bright. I read an article that he’s currently in prison for some very horrible things. I’m sorry to tell you this, but I felt it had to be said. If you meant that guy in Texas, that’s a completely different person. Does anyone know who the other thief was in this episode? I’m curious about what would’ve happened if Radar had taken the West Point exam and passed. I’m convinced that this was at least one of the earliest written season 6 episodes, as Winchester’s whole storyline about swindling the Koreans could just as easily have been written for Frank. Right down to the dialogue, in places. Overall a good episode though it doesn’t quite rank as a favorite. This is the first I’ve read that it may have been written with Frank in mind and later adapted to Charles, but that would explain a lot. The entire plot of Charles’ mercenary profiteering on the scrip exchange is quite believable, but the crude way it is handled always seemed out of character. Charles would be more devious, less blatant; he would cheat the Koreans just as badly but be less obvious about it. Klinger comes off very poorly here; the man is quirky, but not stupid. I always thought Klinger’s attempt to get into West Point funny, if a bit of a stretch-they do have very high standards, and I’m not sure that a Congressman’s influence would have helped. I’ve also wondered what might have happened if he’d passed. This seemed to mark a turning point where Klinger turned to other scams besides wearing women’s clothing to get out of the Army. The other story involving Charles was a bit of an insult to his character-he would have been smarter than Frank about scheming for money, and why would he have needed it anyway, as he was already wealthy? Still, it goes with the arrogance Charles showed in his earlier episodes. Klinger’s intentions after entering West Point were very simple. He’d cheat on the first exam he’d take, get caught, then thrown out, and he’d be free. But he wasn’t deterred after failing the entrance exam. He figured to enroll at Annapolis. I guess the writers were still fleshing out Charles’s mind set. The South Koreans’ money is confiscated from Charles to Hawkeye who takes out enough to pay Boone and gives the rest back to Charles. Boone’s money was returned to Father Mulcahy who gave it to the orphanage. So, Boone got paid. The orphans got a nice donation. And the South Koreans got stiffed.